The Skinny: Freesia is a futuristic action drama that chooses to abandon its killer hook in the third act to focus on its characters. However, this is a rare case where following conventions might have made it a better film. Comics tend to possess hyperactive and surreal images that may encounter limitations when translated to live-action. One approach has been for directors to try to carry the same energy from the comic to the screen. On the other hand, some Japanese filmmakers have taken fast-paced comic images and actually toned them down for live-action. Case in point: director Fumihiko Sori turned Taiyo Matsumoto's sports comic Ping Pong into a unique cerebral sports psychological drama with exciting ping pong sequences. Kazuyoshi Kumakiri's Freesia gives a similar treatment to Jiro Matsumoto's comic of the same name, taking an undeniably sensational hook and putting it in the context of a character drama. However, unlike Ping Pong, neither the hook nor the character drama leave a lasting impression. The setting is a near-future, at-war Japan, which has established a law allowing victims of violent crimes to get revenge with hired executioners. Restricted within an area, the criminal and a bodyguard (which can be provided by the government) can fight to the death and even live if they can kill all the executioners. New to this execution work is Hiroshi (Tetsuji Tamayama), whose icy exterior and inability to feel pain make him perfect for the job. Made numb by a military experiment involving the instant freezing of an affected area, Hiroshi is eventually appointed by his agent Mariko (the single-named Tsugumi) to execute Toshio (Hidetoshi Nishijima), his ex-superior officer from the army. As these three characters' fates start to converge towards a final showdown, their shared past also gradually becomes clearer. Conventional filmmaking would have turned Freesia's exciting premise into a bloody and exaggerated action film with blood, guts, bullets, and over-the-top characters. Kumakiri and usual screenwriter Takashi Ujita do deliver some of that in the bloody opening sequence. However, after the episodic first hour ends, the film gradually shifts its focus to the three main characters, and fully abandons the gimmicky premise by the time the film reaches its finale. But when the revelation of the characters' shared past arrives, it's actually neither particularly surprising nor affecting. Instead of truly pitting expert killers Hiroshi and Toshio against one another, the filmmakers instead show a sudden humanity not hinted at before. While that humanity may make Freesia a more compelling film in theory, neither the story nor its characters have been developed enough to deserve such focus. In fact, the filmmakers remain so focused on the characters that they also intentionally lose sight of the film's settings. While some scenes suggest that Japan has fallen into a chaotic mess with the ultra-nationalists in power, the filmmakers seem to push that detail aside as an afterthought. In fact, a scene of Hiroshi continuing to eat his spaghetti indifferently as rioters get beaten up by police may best represent the filmmakers' sentiments. While Kumakiri should get credit for making a conscious choice to not focus on the Vengeance Law's effect on a societal scale, the hook gradually becomes less and less necessary as the film progresses. Up to that point, the best thing about Freesia remains its concept and Kumakiri's execution (no pun intended). The violence does get bloody enough to earn its restrictive rating in Japan, and the scenes are done with enough brutality to satisfy established fans of the source material. 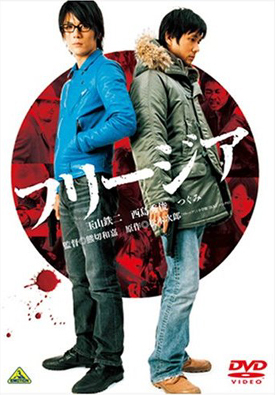 The filmmakers do put in enough of the usual outlandish Japanese action trademarks to make an interesting action drama for at least two-thirds of the film. People who complain that action films tend to ignore characterization and actual storytelling for over-the-top action will likely appreciate what Freesia tries to do. Even though film's handling of the characters makes them too detached for the audience to establish any type of connection with them, one can actually argue that the characters are supposed to be coded in that fashion.